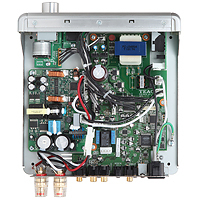 TEAC's A-H01 combines a high-quality D/A converter with a stereo amplifier to create a compact audio system for your home or office. Five stereo inputs are available – 2 analog and 3 digital format. The Burr Brown digital-to-analog converter supports high-resolution sample rates up to 192kHz/32-bit. The amplifier circuitry uses the 50ASX2 by Bang & Olufsen ICEpower of Denmark. High efficiency conversion allows compact dimensions despite high-output (60W + 60W) – power comparable to full-size amplifiers. Energy efficient design minimizes power consumption (34W) compared to the approximately 85W consumed by conventional products (45W + 45W). Despite its compact dimensions, the A-H01 offers the full range of connection outputs a listener would except of an amplifier designed for use in PC-based audio setups, including two digital inputs (one coaxial and one optical) and two analog inputs, in addition to a USB port (for connecting to a PC). The speaker connections are large binding post accommodating cables up to AWG8. The speaker connectors also support BANANA plugs and a subwoofer pre-out terminal. A headphone jack lets users enjoy audio late at night, in spaces with neighbors close by or other situations where speaker playback might disturb others. 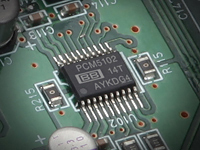 The A-H01 uses a Burr-Brown PCM5102 DAC. After installing the appropriate driver, listeners simply connect a Windows or Mac computer via a USB cable to ensure a digital signal path all the way to the DAC, transforming the iTunes or other media players into high quality audio devices. The A-H01's specifications will satisfy even the most fastidious of audiophiles, including support for audio sources of up to 24bit/192kHz and asynchronous USB. A-H01 incorporates a motor-driven volume knob and an aluminum front panel. Other components, including the large binding post speaker terminals and 3-pin power socket, are the same size as those found on full-size amplifiers. These design decisions ensure ease of use and secure connections, they also suggest the no-compromise approach taken in designing this compact audio unit. Efforts to eliminate signal noise for high-quality audio playback mean nothing with a noisy amplifier fan. To achieve the dual goals of high performance and compact dimensions – two parameters that conflict with efficient heat dissipation – circuit design and chassis design emphasized the selection and effective placement of potential heat-generating components to allow this high-performance compact amplifier to operate without cooling fans.